Group D of the 2018 FIFA World Cup took place from 16 to 26 June 2018. The group consists of Argentina, Iceland, Croatia, and Nigeria. The top two teams, Croatia and Argentina, advanced to the round of 16. 2018 postage stamp from Russia depicting Group D of the 2018 FIFA World Cup group stage. The winners of Group D, Croatia, advanced to play the runners-up of Group C, Denmark. The runners-up of Group D, Argentina, advanced to play the winners of Group C, France. Despite stamping their authority on the game's opening stages, Argentina struggled to find space against the Icelandic defence. Argentina then at the 19th minute scored, giving them a 1–0 lead. Alfreð Finnbogason made history by scoring his country's first World Cup goal just four minutes later when he slotted to the net from six yards out. Argentina then had the chance to go ahead again when Hörður Björgvin Magnússon pushed Maximiliano Meza inside the box after 64 minutes. Hannes Þór Halldórsson dove to his right to deny Lionel Messi a goal. Although Argentina continued to press for a goal, they were repeatedly denied by the Nordics' defense. Argentina failed to win their opening match at a World Cup tournament for the first time since losing to Cameroon in 1990, and it was the first time they drew their opener in the competition. Argentina have missed their last two penalties taken at a World Cup finals (excluding shootouts), with Ariel Ortega failing to convert against Sweden in 2002 before Messi's effort against Iceland in 2018. The Iceland forward's goal after 23 minutes was the earliest scored for a nation playing in their first World Cup match since Rashidi Yekini netted after 21 minutes for Nigeria against Bulgaria on 21 June 1994. Ivan Perišić went closest to hitting the target with an effort from 20 metres after a quarter of an hour, but in the end it was Nigeria's Oghenekaro Etebo who brought joy to the huge Croatian contingent in Kaliningrad, beating his own goalkeeper following a Luka Modrić corner which deflected off Perišić and Mario Mandžukić. Alex Iwobi, after wriggling into space on the left side of the box, he hit a shot directly into a Croatia defender. Ante Rebić fired over from Perišić's left-wing centre, with Odion Ighalo's header recording the match's first shot on target in the 59th minute. William Troost-Ekong was penalised for holding Mandžukić in the penalty area, and Modrić sent Francis Uzoho the wrong way from 12 yards for his first World Cup goal. Croatia have won their opening game of a World Cup for the first time since their debut in the competition in 1998 (3–1 vs Jamaica). Nigeria became the first team in World Cup history to concede two consecutive own goals in the competition, with their last goal shipped in 2014, against France in the last 16, also coming in this manner. The two teams had met in four matches, including one game at the 1998 FIFA World Cup, an Argentina 1–0 victory. Ivan Perišić surged into space down the left and shot towards the bottom-right corner, which was tipped around the post by Willy Caballero. A Dejan Lovren block prevented Maximiliano Meza's low strike finding the net and then Marcos Acuña's cross clipped the top of Danijel Subašić's crossbar. Enzo Pérez struck wide from 15 yards. Three minutes later, Mario Mandžukić flashed a header wide of Caballero's right-hand post from six yards. Eight minutes into the second half, Ante Rebić shot a right foot volley past Caballero after the goalkeeper's mishit an attempted chip over his head. Subašić kept out Meza's close-range effort from substitute Gonzalo Higuaín's cutback. With ten minutes remaining Luka Modrić curled in from 20 yards with his right foot to the right corner of the net to score Croatia's second. Ivan Rakitić was fouled by Javier Mascherano – Nicolás Otamendi receiving a booking for appearing to kick the ball towards Rakitić's head as tempers flared – and crashed the resulting free-kick against the crossbar. Rakitić in the 91st minute, though, slotted home from the centre of the box after his initial shot deflected off Caballero and found Mateo Kovačić who passed it back to Rakitić from the left. With their second win in a row, Croatia advanced to the round of 16 for the first time since 1998, having been eliminated in 2002, 2006 and 2014 editions. This was Croatia's first victory in five attempts against a South American team at the World Cup, having lost the previous four. This was Argentina's heaviest defeat in the first-round group stage of a World Cup since losing 6–1 to Czechoslovakia in 1958. Argentina have failed to win either of their opening two group stage matches for the first time since 1974. The two teams had met only once, a friendly game in 1981, won by Iceland 3–0. Gylfi Sigurðsson shot a sixth-minute chance straight at Francis Uzoho. In the last minute of the first half, Alfreð Finnbogason was unable to get a decisive touch on Sigurðsson's free-kick delivered from the right wing. In the 49th minute, Victor Moses' cross was collected by Ahmed Musa, who first controlled it in the air with his right foot before scoring on the half-volley powerfully to the net. Hannes Þór Halldórsson tipped over a deflected drive from Wilfred Ndidi. In the 75th minute, fed by Kenneth Omeruo, Musa burst clear in the left channel, cut inside and rounded Halldórsson before scoring with his right foot. A late VAR review spotted that substitute Tyronne Ebuehi had tripped Finnbogason, with Sigurðsson's spot-kick effort clearing the crossbar. Iceland are the third World Cup debutants from Europe to have faced Nigeria at the tournament, and on every occasion Nigeria have emerged victorious, following victories against Greece (2–0) in 1994 and Bosnia and Herzegovina (1–0) in 2014. Uzoho is the second youngest goalkeeper to keep a clean sheet in a World Cup match (19 years, 237 days), behind only Lee Chang-myung in North Korea's 1–0 win over Italy in July 1966 (19 years, 198 days). This is Nigeria's first victory in a World Cup game by a margin of more than one goal since they beat Greece 2–0 in 1994 at their first World Cup tournament. This was Iceland's first group stage's defeat in any big tournament. The two teams had met in eight matches, including four games at FIFA World Cup group stages, in 1994, 2002, 2010 and 2014, all won by Argentina. Ahmed Musa narrowly cleared the crossbar in the early minutes of the game. In the 14th minute, Éver Banega shot the ball over the top, Lionel Messi controlled a pass over the top from Éver Banega ball on his thigh and his left boot before shooting a right-footed drive past Francis Uzoho from the right. Leon Balogun brought Ángel Di María down 25 yards from goal, but Uzoho tipped Messi's free-kick to his left-hand post. Oghenekaro Etebo narrowly missed with a long-range free-kick. Leon Balogun was held in the penalty area by Javier Mascherano after a corner form the left, Victor Moses scored from the resulting penalty shooting low to the right with the goalkeeper diving the other way. Gabriel Mercado raided down the right and bent a cross into the penalty area, Marcos Rojo, the man who scored the decisive goal right against Nigeria four years ago in Brazil, once again tucked home a low right-footed volley to give Argentina the win. Messi's strike brought up the century for goals at Russia 2018. He also joined Diego Maradona and Gabriel Batistuta in becoming the third Argentina player to score in three World Cups. Rojo became the only player to score decisive goal against Nigeria in two World Cups. The two teams had met in six matches, most recently in 2017 for the 2018 FIFA World Cup qualification, which ended in a 1–0 Iceland victory. Hörður Magnússon headed wide from Jóhann Guðmundsson's outswinging corner. Alfreð Finnbogason shot wide from the edge of the area. Birkir Bjarnason pounced from a corner, but Lovre Kalinić made a save from Aron Gunnarsson's curling effort. At the restart, Milan Badelj's strike clattered off the crossbar. Badelj got his goal when he reacted to a loose ball in the Iceland box and hammered home from close range. Sverrir Ingason's header rebounded back off the bar. Dejan Lovren's handball though enabled Gylfi Sigurðsson to score from the spot in the 76th minute. Badelj provided a throughball and, having outpaced his marker, Ivan Perišić lashed home to score the winner. Croatia have topped a world finals group for the first time in their history, and because of Croatia's victory, Argentina also qualified. With the defeat, Iceland stood bottom in the group with a single point. ^ a b "2018 FIFA World Cup – Statistical Kit" (PDF). FIFA.com. ^ a b "Iceland thwart Argentina on World Cup debut". FIFA.com. 16 June 2018. ^ Lancaster, Rob (16 June 2018). "Finnbogason makes history as Messi fluffs his big chance". Goal.com. ^ Bevan, Chris (16 June 2018). "Argentina 1 Iceland 1". BBC Sport. ^ "Match report – Group D – Argentina v Iceland" (PDF). FIFA.com. Fédération Internationale de Football Association. 16 June 2018. Retrieved 16 June 2018. ^ a b c "Tactical Line-up – Group D – Argentina v Iceland" (PDF). FIFA.com. Fédération Internationale de Football Association. 16 June 2018. Retrieved 16 June 2018. ^ "Argentina v Iceland – Man of the Match". FIFA.com. Fédération Internationale de Football Association. 16 June 2018. Retrieved 16 June 2018. ^ a b "Modric-inspired Croatia open with a win". FIFA.com. 16 June 2018. ^ a b Smith, Jamie (16 June 2018). "Etebo own goal, Modric penalty settle tight clash". Goal.com. ^ Whalley, Mike (16 June 2018). "Croatia 2 Nigeria 0". BBC Sport. ^ "Match report – Group D – Croatia v Nigeria" (PDF). FIFA.com. Fédération Internationale de Football Association. 16 June 2018. Retrieved 16 June 2018. ^ a b c "Tactical Line-up – Group D – Croatia v Nigeria" (PDF). FIFA.com. Fédération Internationale de Football Association. 16 June 2018. Retrieved 16 June 2018. ^ "Croatia v Nigeria – Man of the Match". FIFA.com. Fédération Internationale de Football Association. 16 June 2018. Retrieved 16 June 2018. ^ a b c d "2018 FIFA World Cup – Statistical Kit" (PDF). FIFA.com. p. 9. ^ Atkinson, Guy (21 June 2018). "Caballero drops clanger as Messi's men are stunned". Goal.com. ^ "Croatia advance on a dark night for Argentina". FIFA.com. 21 June 2018. ^ Jennings, Patrick (21 June 2018). "Argentina 0 Croatia 3". BBC Sport. ^ "Match report – Group D – Argentina v Croatia" (PDF). FIFA.com. Fédération Internationale de Football Association. 21 June 2018. Retrieved 21 June 2018. 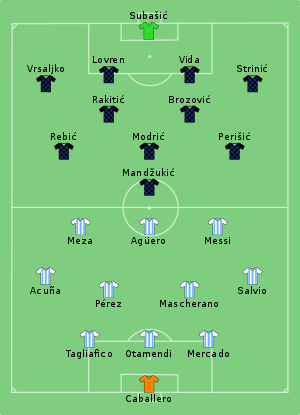 ^ a b c "Tactical Line-up – Group D – Argentina v Croatia" (PDF). FIFA.com. Fédération Internationale de Football Association. 21 June 2018. Retrieved 21 June 2018. ^ "Argentina v Croatia – Man of the Match". FIFA.com. Fédération Internationale de Football Association. 21 June 2018. Retrieved 21 June 2018. ^ Smith, Jamie (22 June 2018). "Musa brace boosts Super Eagles & Argentina". Goal.com. ^ "Musa brace brings Nigeria back into contention". FIFA.com. 22 June 2018. ^ Johnston, Neil (22 June 2018). "Nigeria 2 Iceland 0". BBC Sport. ^ "Match report – Group D – Nigeria v Iceland" (PDF). FIFA.com. Fédération Internationale de Football Association. 22 June 2018. Retrieved 22 June 2018. ^ a b c "Tactical Line-up – Group D – Nigeria v Iceland" (PDF). FIFA.com. Fédération Internationale de Football Association. 22 June 2018. Retrieved 22 June 2018. ^ "Nigeria v Iceland – Man of the Match". FIFA.com. Fédération Internationale de Football Association. 22 June 2018. Retrieved 22 June 2018. ^ Smith, Jamie (26 June 2018). "Late Rojo stunner saves Messi's men". Goal.com. ^ Skelton, Jack (26 June 2018). "Nigeria 1 Argentina 2". BBC Sport. ^ "Rojo returns to haunt Nigeria as Argentina progress". FIFA.com. 26 June 2018. ^ "Match report – Group D – Nigeria v Argentina" (PDF). FIFA.com. Fédération Internationale de Football Association. 26 June 2018. Retrieved 26 June 2018. 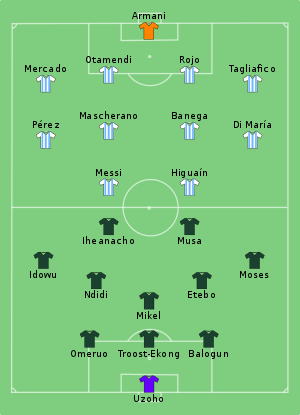 ^ a b c "Tactical Line-up – Group D – Nigeria v Argentina" (PDF). FIFA.com. Fédération Internationale de Football Association. 26 June 2018. Retrieved 26 June 2018. ^ "Nigeria v Argentina – Man of the Match". FIFA.com. Fédération Internationale de Football Association. 26 June 2018. Retrieved 26 June 2018. ^ Reddy, Luke (26 June 2018). "Iceland 1 Croatia 2". BBC Sport. ^ Ridge, Patric (26 June 2018). "Perisic strikes late on to secure maximum points". Goal.com. ^ "Croatia send brave Iceland home". FIFA.com. 26 June 2018. ^ "Match report – Group D – Iceland v Croatia" (PDF). FIFA.com. Fédération Internationale de Football Association. 26 June 2018. Retrieved 26 June 2018. ^ a b c "Tactical Line-up – Group D – Iceland v Croatia" (PDF). FIFA.com. Fédération Internationale de Football Association. 26 June 2018. Retrieved 26 June 2018. ^ "Iceland v Croatia – Man of the Match". FIFA.com. Fédération Internationale de Football Association. 26 June 2018. Retrieved 26 June 2018. The Croatia national football team (Croatian: Hrvatska nogometna reprezentacija) represents Croatia in international association football matches. The team is controlled by the Croatian Football Federation (HNS), the nation's governing body for football, and is widely supported throughout the country due to the ever-present popularity of the sport. Most home matches are played at the Stadion Maksimir in Zagreb or though other smaller venues are also used occasionally. They are one of the youngest national teams (since formation) to reach the knockout stage of a major tournament, as well as the youngest team to occupy the top 10 in the FIFA World Rankings. Croatia has represented itself as an independent nation since 1993, when the team was officially recognised by both FIFA and UEFA following dissolution from Yugoslavia. However, short-lived national sides were briefly active during periods of political upheaval, representing sovereign states such as the Banovina of Croatia from 1939 to 1941, or the Independent State of Croatia from 1941 to 1944. Before the current team was formed, most Croatian players represented the Socialist Federal Republic of Yugoslavia instead. The modern-day team has played competitive matches since 1994, starting with a successful qualifying campaign for the 1996 European Championships. In 1998, they competed in their first FIFA World Cup, finishing 3rd and providing the tournament's top scorer, Davor Šuker. Exactly twenty years later, under their second golden generation, Croatia reached the 2018 World Cup Final, securing second place after losing to France. Captain Luka Modrić was awarded best player of the tournament for his performances, thus making him the first ever Croatian player to win the award. Among other nicknames, the team is colloquially referred to as the Vatreni ("Blazers" or "Fiery Ones") or the Kockasti ("Chequered"). In the Italian-speaking counties the team is known as Il furioso incendio ("The Blazing Fire"). Since becoming eligible to compete, Croatia has only failed to qualify for two major tournaments; the 2000 European Championship and the 2010 FIFA World Cup. Their biggest defeat came in 2018 with a 6–0 loss to Spain, while their highest-scoring victory was a 10–0 friendly win over San Marino in 2016. The national team is also known for some long-standing rivalries, such as the Derby Adriatico with Italy, or the politically-charged rivalry with Serbia, both of which have led to controversial or disruptive matches. The team represents the second-smallest country by population and land mass to reach the World Cup final, behind Uruguay and Netherlands respectively. At major tournaments, Croatia holds joint-records for longest period between one goal and another of a player (2002–2014), most penalty shootouts played (2), most extra time periods played (3) and most penalties saved in a match (3). They are also one of only two teams—along with Colombia—to be named FIFA's "Best Mover of the Year" more than once, winning the award in 1994 and 1998. Upon admission to FIFA, Croatia was ranked 125th in the world; following the 1998 World Cup campaign, the side rose to third place in the rankings, making it the most volatile team in FIFA Rankings history. D Grubu, Turkish artists group founded in 1933 by Zeki Faik İzer, Nurullah Berk, Elif Naci, Cemal Tollu, Abidin Dino and Zühtü Müridoğlu.